OESCGS Specialty in January, 2011.
and SnowDowne Snow Cloud (Oliver). 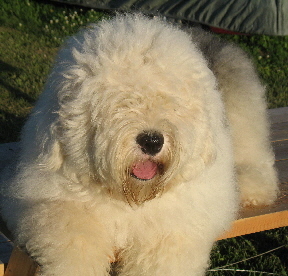 Snow typifies the breed type that so many of today’s sheepdogs have lost. He reminds us of Ch Fezziwig Ceiling Zero with his massive head, bone and body. 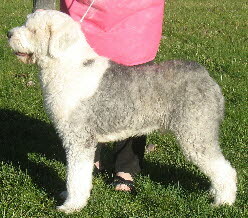 Snow has a beautiful head, and lots of bone in a square, compact body. He also has that correct crisp coat that is so nice to keep up. He has nicely balanced front to rear angulation, and this is demonstrated in an easy, smooth side gait. 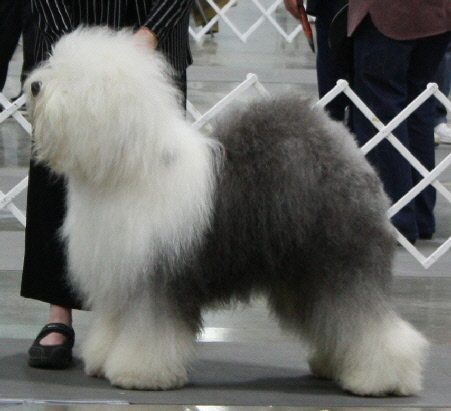 Snow also represents SnowDowne’s 50th AKC champion. We are very proud of this accomplishment, and Snow was a great dog to achieve this honor for us.